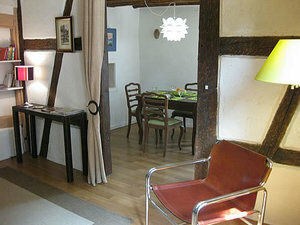 We provide 3 furnished apartments for rent in the heart of Colmar, in the historic district. All rentals are located in traditional Alsatian houses, with picturesque architecture. They are all accessible by car, close to free parkings and 15 minutes walk from the train station. In an authentic Alsatian house (Cliquot house) dating from 1610, located 2 steps from Little Venice, this 50 sqm furnished apartment can accommodate 2 to 4 persons. The apartment is on the top floor of a 2-storey building. Quiet and cozy, it includes a separate bedroom (double bed) overlooking the courtyard, a living room with a very comfortable sofa bed (Rapido system), a dining room with colorful tableware to set a nice looking table, a separate kitchen, a bathroom with shower and separate toilet. You can park in front of the house (toll) or in a free parking nearby. Located 50 meters from the Little Venice, in the historical center of Colmar, the apartment is close to shops, restaurants, cinemas, museums. This is the perfect place to visit Colmar and walk through the old city.